Featuring a lighter, gluten-free cucumber base, we’ve embellished one of our favorites, whipped feta, with some chopped green olives and pimento. It’s a simple combination that is guaranteed to generate swoons. All of the key flavors originate in the Mediterranean, so it’s perhaps natural that they pair well with each other. 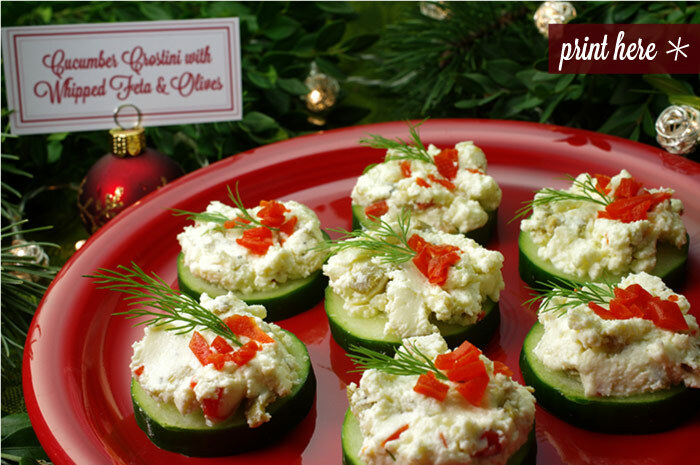 Use thicker slices of cucumber, about 1/4-inch, to provide a sturdy base on the canapé tray. Substitute black olives, or capers if you like. Top the crostini with a sprig of dill and some chopped pimento. 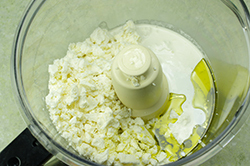 (1) Crumble the feta cheese into the work bowl of a food processor. 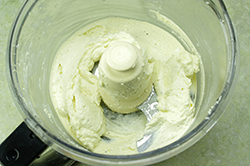 Add the cream, olive oil, and lemon juice, and pepper, and process until very smooth. (2) Remove the mixture and place in a small bowl. Add the chopped green olives and stir to combine. Refrigerate until ready to serve; remove 30 minutes prior to assembling to soften. 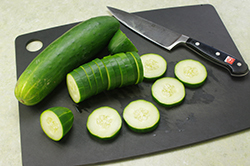 (3) Trim the ends of the cucumbers, slice into rounds about 1/4-inch thick leaving the peel intact. 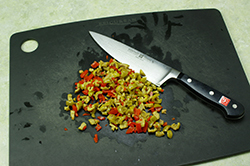 Place in a single layer on a serving platter. Place a dollop of the whipped feta on each cucumber round. Garnish with a sprig of fresh dill and few pieces of chopped pimento. 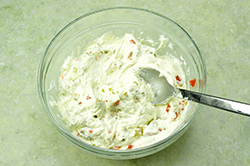 (1) Mix the whipped feta up to 2 days prior to serving.